It’s not hard to see that one of the hottest gifts this year is going to be wearable electronics for the purpose of tracking your fitness and exercise. For years, of course, people carried around pedometers to track their steps. The advent of smartphones changed all that. Suddenly, you could do more than just see how many steps you took in the day. You could see your fitness profile for the entire day…how much you walked, how much you ran, and how much you just sat around. After years of her talking about it, I got my sister the granddaddy of wearable fitness trackers, the a Fitbit . When they went on sale at Best Buy I decided to splurge and got myself an Apple Watch (on our sister blog Gaming.Fit I’ll go through the steps of how I use the Apple Watch as a FitBit). With everyone in the family wearing wearable technology, the little ones in your household might feel a little left out. They’re already not happy because everyone has a smartphone except for them, and seeing everyone with these things on their wrist except for themselves is bound to make them feel left out. Target comes to the rescue with a brilliant idea. For the price of about a third of the cost of a FitBit and a tenth of the cost of an Apple Watch, you can pick up a colorful UNICEF Kid Power Band. It comes in orange and blue, and in a very timely and brilliant licensing move, it worked with Disney to also produce two limited edition “Star Wars: Force for Change” colors to coincide with the release of Star Wars: The Force Awakens. 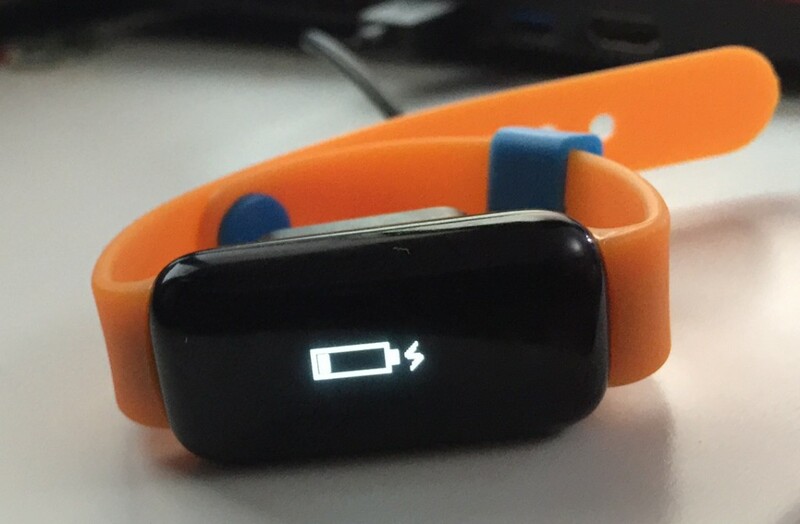 The inspiration for these Power Bands is obviously the FitBit, which has successfully “gamified” exercise (how many of you with FitBits deliberately walked that extra flight of stairs just so you can collect your “points” for the day?). The same thing happens with these watches. The only difference is, “points” in this case aren’t just theoretical or psychological, but result in very real change in the world. As an adult, you can purchase a UNICEF Kid Power Band for your child or a child in your life, and help them download an app called Kid Power. Out of this purchase price Target will donate $10 to the US Fund for UNICEF. These “points” aren’t just for show; they’ll unlock therapeutic food packets that UNICEF delivers to severely malnourished children around the world (by way of corporate sponsors and individuals who pledge). 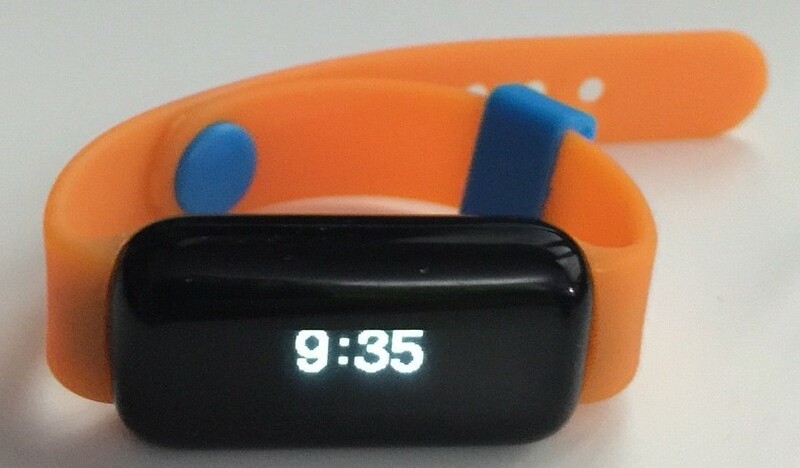 The band is basically a pedometer and accelerometer, so it’s not quite as complex as a FitBit that calculates things like calories, active minutes, floors climbed, and so on. On the other hand, a lot of that stuff is really overkill for kids–just tracking the number of steps is enough for most. I can’t say enough about this great idea. It encourages kids to exercise, it helps them feel “just like mom and dad” with their own wearable technology, and perhaps most importantly, it teaches them to look beyond their immediate surroundings and realize how blessed they are as well as the value of helping others who are less fortunate than them. We live in strange times today where one out of every four children in the United States is inactive, meaning they may be on a road to obesity as an adult, while at the same time one out of every four children worldwide suffers from malnutrition, meaning that many will be at risk of starvation. This product is an amazing idea, and a great way to help everyone on both extremes. Here’s how the band works in practice. You’ll get these two items in the package–a plastic band with a stylish strap and a thin watch-like face and a USB charger that’s pretty slick in that it attaches to the back of the watch magnetically, much like Apple’s watch. 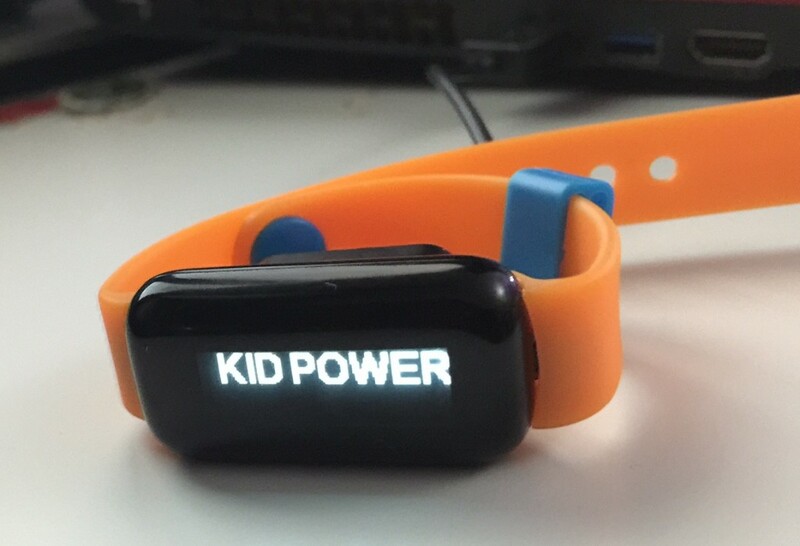 When you first plug it in, the words “UNICEF” and “KID POWER” will flash on the watch face. The first thing I noticed was that this isn’t some weak LCD watch, but the display was OLED, with the words bright, white, and jumping off the black dial. A battery icon will show that it’s charging. 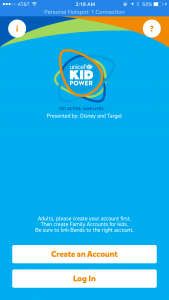 Next, you download the UNICEF Kids Power app on iOS or Android. The app take a little getting used to. 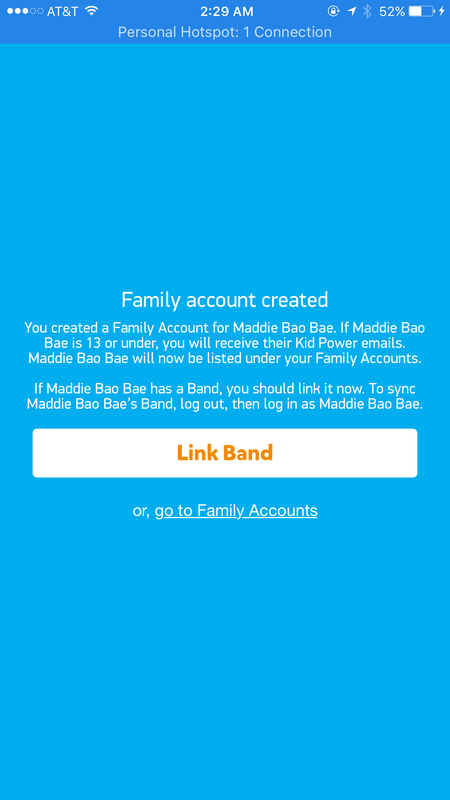 The grown-up in the house sets up a master account first, and then sets up accounts for each of the family members. When you set up an account, you enter a screen name, your birthday, choose an icon of various sports, and your email address. 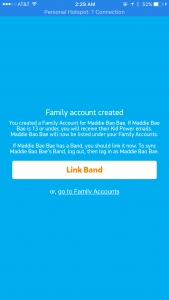 That’ll set up the master Family account, and then you can set up sub-accounts for the members of your family and link your Power Band to the right account. Admittedly there are usability improvements they need to make. You need to contact them to do things like transfer Family Accounts to someone else or remove Family Accounts, which leads me to suspect that they rushed this to market without building some basic things. What’s cool is that once the band is charged it’ll display the name you typed in to show whose it is. 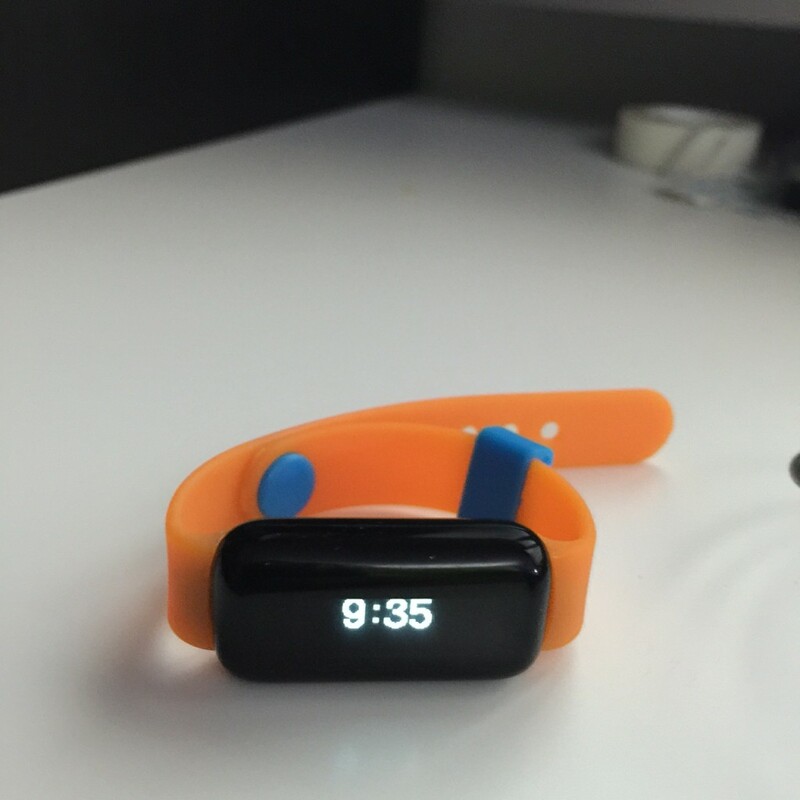 Tap on the watch face once and the time of day will scroll in, making this a bona-fide watch. Tap on it again and it’ll show you an icon of two footprints, showing the steps you’ve taken. Tap on it one more time and you’ll see an icon of an airplane, which I believe shows the the “missions” that the child has completed. The whole thing with “missions” takes a little getting used to. It looks like you need to purchase credits with physical money ($3.99 a credit) in order to unlock these. Once you do, you unlock in-app content from people like Alex Morgan, Maya Moore (Haiti), Tyson Chandler (Uganda), Burkina Faso (David Ortiz). While the money is of course well spent, I would have liked to see a little more “freemium” content rather than just blocking everything until someone buys credits. But overall, it’s a great idea and fills a big gap as far as helping kids get more active and at the same time help those who are less fortunate than them. I definitely recommend picking one up at your local Target or ordering one here.